The Scout Sport is perfect for going cruising through flat waters that have a lot of twists and turns. It’s capable of quick turnarounds for when the path takes a sudden change in direction or when you find yourself in a precarious situation. It can also work if you decide you want to catch some little waves. It’s an excellent board for seeing the sites around your waters and touring the neighborhood on a sunny day. It behaves like your standard SUP but with a little extra maneuverability. The increased rocker allows for tighter, sharper turns. This also enables it to navigate well through a fair amount of choppiness. Even with this added ability, it still has enough stability for beginners to feel comfortable on. It reaches 11’4” and can hold up to 225lbs with its 202 liters of board volume. It weighs 33lbs with a hefty 6 ½” nose rocker and 3” tail rocker. It comes in three colors: blue, gray and yellow. 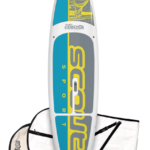 And it comes with a displacement hull, center and side fins, 10’ coil leash, spare vent cap and board bag. Great maneuverability. 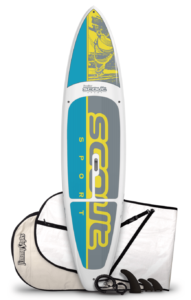 Works best for flat water cruising but can perform will in small waves if you decide to try surfing. Very stable and good for learning the basics. Doesn’t handle the speed of surfing on bigger waves. It’s heavy. A great board for fitting in smaller pockets and navigating through diverse seascapes with tricky corridors and narrow passageways. Good for getting out of and escaping tight situations where quick movements are essential. the scout sport model vent cap and extra cap for vent supplied by JS is confusing 1st the screw on cap on the board vent is vented 3 slots in top cap the extra cap supplied by JS is solid no vents or slots I would think the vented cap that screws on at the center handle would leak water into the board which JS says they don’t want. The supplied extra cap is just a solid cap no vent so what is supposed to be used and why is the extra cap not vented with 3 slots like the one on the board or why is the cap supplied with the board not solid. The Jimmy Styes manual says your supposed to loosen cap when out of water tighten cap before putting board in water so no water is allowed to saturate interior of board loosen cap for storage to breath. this is in manual, I’ve called JS now going on 3 days no response from JS. I reached out to JS directly to get the correct answer to your question. They will either get back to you directly or post here. I’ve not heard back yet. Pretty disappointing customer service. I will let you know if they get back to me. I added a note to the top of the review to make sure people are aware of the non-existent customer service.